For a taste of something different, we decided to take a day trip from Saint Petersburg. Petrodvorets, or Peter’s Palace, was located 30km west of the city, overlooking the Gulf of Finland, and reachable by a suburban train. Negotiating the Cyrillic-labeled signage in Russia has been challenging and the train station was no exception. There was no English-language signage but we had figured out the Russian word for tickets: Kacci. The ticketing agents did not speak English but, through trial and error (getting shooed away in curt Russian by several window dwellers), and with a series of gestures that resembled a hopeless game of Charades, we secured a couple of round trip tickets. The highlight of our one-hour journey was the steady stream of vendors who arrived at the head of our car, recited a brief commercial, and sauntered down the aisle hoping for a sale. In addition to the magazines, pirated DVDs and snacks being sold by previous vendors, one man was selling an odd assortment of dish-washing sponges, drill bits and hand-held back massagers. Capitalism is alive and well in Russia. We arrived at our train station knowing only that Petrodvorets was a long walk away and that local buses ran frequently to the palace complex. We stood in the cold at a bus stop near the station until one of the friendly locals helped us find the right bus. 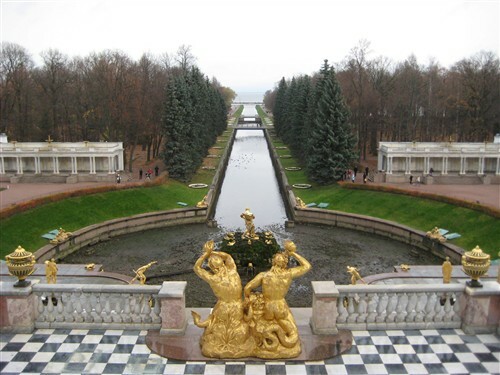 Petrodvorets is a vast estate containing several stunning palaces, manicured gardens, and an impressive array of fountains and bronze statues. It was founded in the early 18th century by Peter the Great, who, on a visit to France, was impressed by Louis XIV’s Palace of Versailles and aspired to build his own, grander version. We entered the upper gardens at the rear of the estate and strolled through the clearly out of season gardens. The magnificent Grand Palace, its beautiful white and yellow façade flanked by two golden-domed chapels, was an impressive sight in the distance. 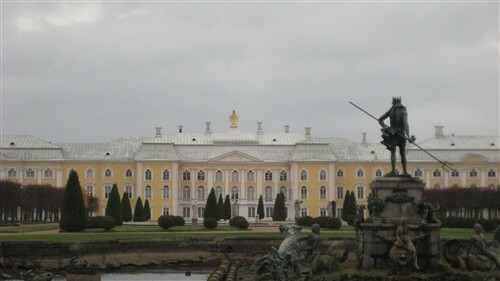 The original palace was almost totally destroyed during the Nazi occupation of Russia in WWII and the Palace that is seen today is a reconstruction of the original. 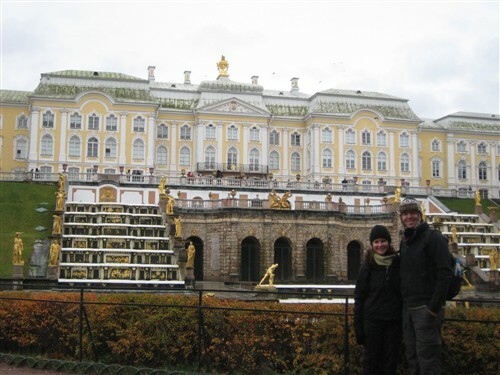 As we approached the front of the Palace we saw the water features for which Petrodvorets is most famous. The Grand Palace sits atop a hill, overlooking the magnificent Grand Cascade – a multi-tiered fountain stepping down the hill, enabling the water to cascade brilliantly downward into Water Avenue, a canal extending all the way to the Gulf of Finland. Petrodvorets has more than 150 fountains adorned with gilded statues but, unfortunately for us, none of them were working. I tried to envision the grandeur of Petrodvorets, but fountains without water are simply not very impressive. Disappointed by the fountains and uninspired by the photos of the interior that we saw in the gift shop, we decided not to go inside. 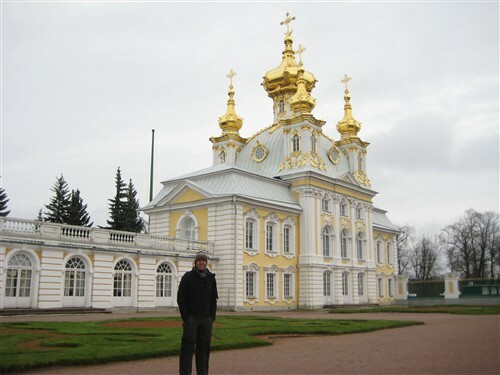 Instead, we strolled leisurely around the palace grounds and then headed for the bus stop, stumbling upon a beautiful onion-domed Orthodox church along the way. When we finally reached the train station it was late afternoon. We had just missed the hourly train back to St. Petersburg. We had an hour to kill and we were starving. Our only option appeared to be a small restaurant/bar/discotheque just outside the train station. Unable to decipher the Russian menu, we ordered the few things that we recognized: shawerma sandwiches, a blini (Russian crepe) and beer. Our cashier, as uncomfortable with the language barrier as we were, eagerly obliged. We sat down at a table in the smoky, circular room (complete with dance floor and disco ball), watching and being watched by everyone else in the room. It was an educational hour. As we sat there eating, our surrealistic day began to take focus. Russia is such an interesting place. It’s a place where there is no tourism infrastructure for foreigners, but friendly locals will still do their best to help. It’s a place where you still struggle to visit a top tourist destination – the “Russian Versailles” – as an independent traveler. It’s a place that has been open to the West for nearly twenty years, but remains shrouded in mystery. There is so much that we do not understand and so much more than meets the eye. Communism may be dead, but the intrigue remains. Traveled September 1, 2007 to December 14, 2008, 470 days total. 1 of 6015 photos in the gallery.